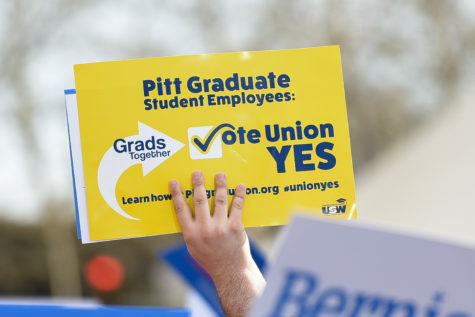 With a voter turnout more than double the previous election’s, Pitt students elected Max Kneis as the next Student Government Board president Tuesday. Kneis, a junior studying economics and finance, received 2,114 votes to win the presidency, which will start at the end of April. Arlind Karpuzi and Justin Horowitz came in with 1,680 and 1,238 votes, respectively. Zuri Kent-Smith, an undecided sophomore, received the highest number of votes among board candidates with 1,625, making him the next executive vice president. 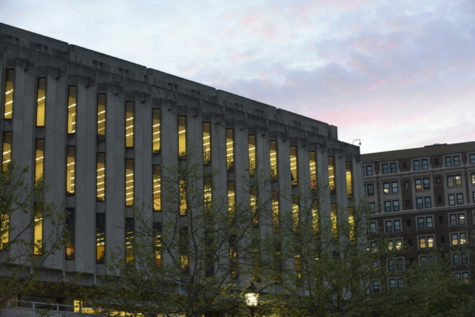 Kneis ran with the 42 Stories slate with a focus on creating 42 changes to Pitt’s campus. 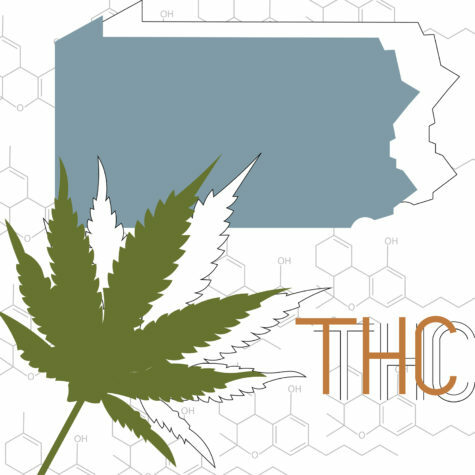 Some of these proposals include pushing for a longer winter break, making women’s healthcare options more accessible and creating a “Blue Light” app to increase student safety. As the results were announced, the members of Kneis’ slate immediately began hugging — some shed a few tears as Kneis leaned in for a celebratory kiss with his girlfriend. “How can we replicate what just happened?” Kneis said as he shook yet another hand after the results were announced. He was referring to the record-breaking number of students who voted in this year’s election. This year also saw an increase in the number of students running for board member positions. In the election for the 2016-17 academic year, only eight candidates ran for board, while 16 ran in this election. This year, 5,177 students voted, which is about 28.76 percent of the student population, an increase from last year when 2,665 students voted in the election. 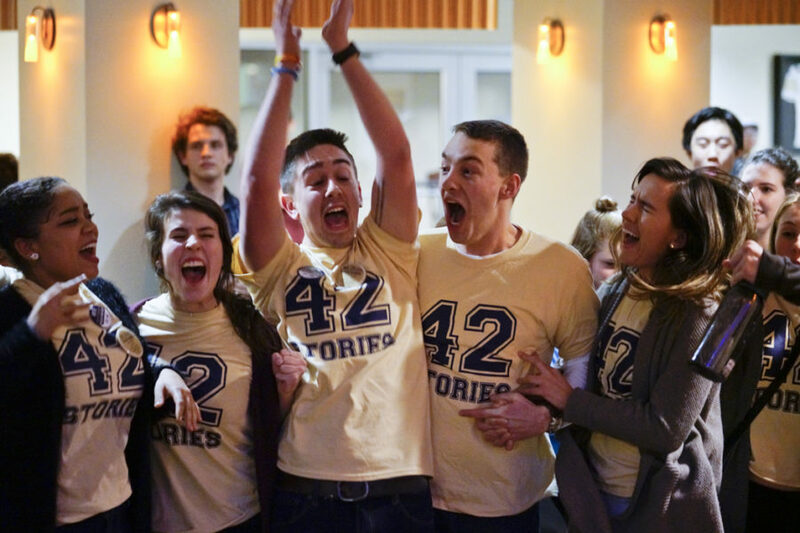 In 2014, a total of 4,127 students voted for an SGB member or president. In 2013, a total of 2,520 students voted. Current SGB President Natalie Dall said she was excited to see the increased voter turnout for this election, which she credited to increased competition among the candidates. In addition to posting in various groups on social media, chalking the sidewalk with colorful campaign slogans and blasted music in front of the William Pitt Union. Student Affairs also ran election notifications on screens across campus from 8 a.m. to 8 p.m. for the first time. According to Elections Chair Julia Lee, SGB attempted to set up physical voting locations this year to mimic how voting happens in national elections but received very little interest from students. Lee said the locations in Towers Lobby seemed less effective than handing out tangible objects, such as pins, encouraging students to vote. Vice-president elect Kent-Smith attributed his success to his running mate Karpuzi and Phil Anderson, a campaign staffer. 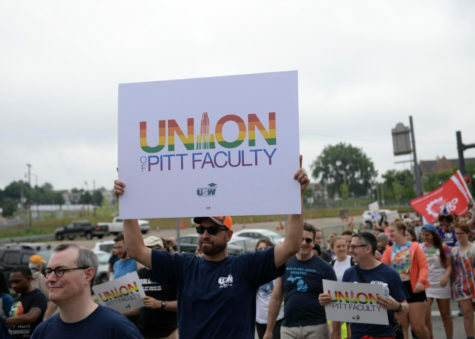 Kent-Smith ran on initiatives — including advocating for students with disabilities and working with admissions and administrations to encourage more local Pittsburgh students to apply — he said he can accomplish regardless of the presidential outcome. Board candidate Ami Fall, a sophomore political science and psychology major, received 1,519 votes. Nihita Manem, a junior neuroscience and psychology major, received 1,474 votes. Maddie Guido, a sophomore biological sciences major, received 1,471 votes. Ciara Barry, a junior finance and marketing major, received 1,373 votes. Ian Callahan, a junior electrical engineering major, received 1,297 votes. Krishani Patel, a junior biology and religious students major, received 923 votes, and Alex Spenceley, a sophomore neuroscience major, received 778 votes. Of the board member-elects, all three 42 Stories board candidates and all three Allies board candidates won seats. Two members of Summit — Patel and Spenceley — also won seats. Fall — a member of 42 Stories — was shaking while Lee announced the results. While Fall said she felt nervous, she “thought that [they] had a good chance” of winning because of how hard they worked throughout their campaign. “All the work we put in the past couple months, it was showing throughout, but it finally is manifesting, and it feels so great,” Fall said. Throughout the day Tuesday, presidential and board candidates handed out flyers, candy and pizza, encouraging students to vote. Sidewalks outside Towers, the William Pitt Union and Posvar Hall were covered in chalk art advertising slates and candidates. President-elect Kneis’ slate used 252 pieces of chalk the night before the election and handed out a couple thousand pieces of candy the day of the election. 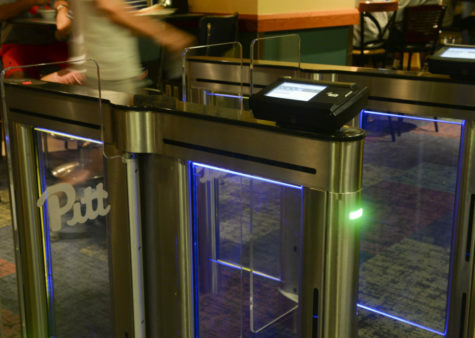 “I got to interact with so many Pitt students. 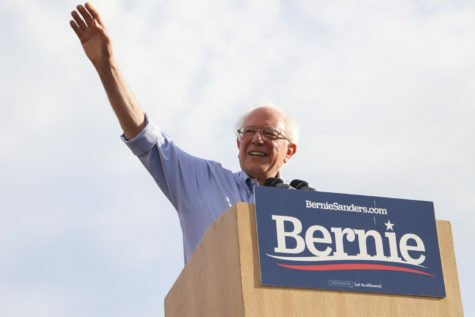 It was a celebration for everything we’ve done in the past few months,” he said. Both Karpuzi and Horowitz were confident in Kneis’ ability to fulfill the obligations of president and plan to continue working toward their campaign initiatives. Although Horowitz was not sure how he plans to push his initiatives in the future, he said he wanted to continue his work in the University Counseling Center on the Mental Health Task Force. He would like to stay involved in student affairs and possibly SGB in the future. “If it’s not me it’s him,” Horowitz said, referring to Kneis’ position as future president. Karpuzi said he did not have any regrets about his campaign. He plans to push for his initiatives during the transition period between SGB Slates, which begins now until the new board takes over, and plans to stay involved through his resident assistant position. 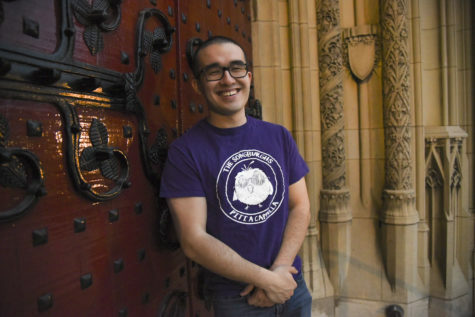 “To be able to run for president of this organization and represent these 18,000 undergrads was a pleasure and an honor,” Karpuzi said. Kneis said now that he’s won the election, he and his board need to decide how to capitalize on the momentum they already have, “not just putting stuff out but taking stuff in,” he said. Guido, another member of 42 Stories, said she wasn’t ready to express her enthusiasm for the board position before the election because she didn’t want to jinx it. Now that she has secured a spot on the board, she’s ready to start working on her initiatives, particularly regarding women’s health. 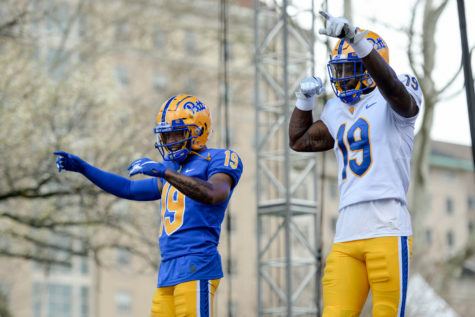 Pitt Wushu requested $9,378.09 for a tournament. The Board approved $4,209.60 and denied $5,168.49. The Panther Swim Club requested $8,635.12 for their nationals tournament at Georgia Tech. The Board approved $6,283.64 and denied $2,351.48. 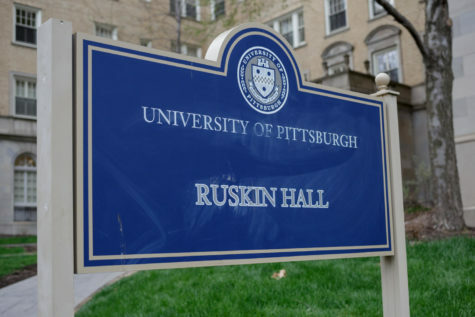 The Student Slovak Club requested $2,600 to host a lecture at Pitt. The Board approved $569.00 and denied $2,031. Women’s Water Polo requested $2,118.62 for league dues. The Board approved in full. The American Institute of Chemical Engineers requested $2,000 to attend a regional student conference. The Board postponed their vote. Model United Nations requested $3,455.41 for a conference. The Board approved the request in full. Pitt Asha for Education requested $5,312.27 for a performance exhibition. The Board approved the request in full. Steel City Bhangra requested $2,496.69 for a competition. The Board approved the request in full. 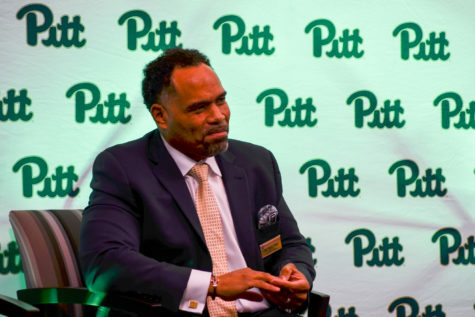 Pitt off the Hook requested $2,000 for a guest speaker. The Board approved the request in full. Robotics and Automation Society requested $1,412.98 for the IEEE APEC Competition. The Board approved the request in full.